The only thing you need to know is: Ensnared was perfect. Now hold your moths, if you know that I’m an aggressive Morpheus-Alyssa shipper, you will think you know how it ended. You will be wrong. The ending is as complex as it is delicious. This is a spoiler free review (yup, no spoilers for Splintered or Unhinged either.) BUT! I need to talk about the finale so they will be in spoiler tags and please please don’t click if you haven’t read Ensnared. I love this trilogy for the epic, feral, gorgeousness of Wonderland. There’s even more cruel beauty in AnyElsewhere. Everything is completely insane. I LOVE IT. The writing just…gosh. If I could ever write half as well as this, I would die happy. I adore the vibrant excruciatingly beautiful detail. And there was so much character development for all the netherlings. Alyssa: We get to see her cruel dark side. She’s like 80% Netherling right now and she’s caving to her bloodlust. Sure she still faints like a damsel in distress a few times, BUT WE’LL FORGIVE HER. On account of the reason. Mwahaha. I cannot tell you, but it’s heartbreaking. Jeb: Guess what?! I don’t hate Jeb anymore! (I always thought he was well written, I just didn’t like him.) I have a lot of respect for him now. There is also the matter of him and Morpheus getting along like a moth on fire. They’re mildly adorable. And I really love Jeb’s wild bitter art. It’s beautiful. Morpheus: Oh well we know he is my favourite. Narcissistic, sassy, snarky, and beautiful. My only screech is that he didn’t come in until page 100. What even. I always need more Morpheus. But I loved his new relationship with Jeb…their banter was priceless. This remains my one of my top trilogies. There is not a minute where I’m not guessing and wondering and hoping and crying about what’ll happen next. Basically I shall flail because this book is beautiful chaos. I am so pleased with this finale. It couldn’t be more perfect, really. The ending is satisfying but leaves me crying because I want more. I will miss Wonderland like nothing else. Thank you Thames and Hudson for the review-copy! Ensnared by A.G. Howard came out in January, 2015. Previous Post: « Weekly Fury #41 || Goodbye January and LET ME FLAIL BECAUSE ENSNARED! OH MY GOSH that happened on my blog too – hopefully not too many people read the spoiler for All the Bright Places! (I accidentally saw the one for There Will Be Lies on yours…but that was my fault because I couldn’t help it). BUT I’M READING IT NOW AND I LOVE IT ALREADY OH MY GOODNESS. The way even the most minor characters (Bill the Lizard eg) are included…I love this series. ALSO DO YOU SERIOUSLY NOT OWN SPLINTERED???? Gah! It's frustrating right?! It makes me not want to use the cool coding things, buuuut, that's half the reason I came to WordPress. Doing cool buttons is FUN. *ahem* I LOVE IT SO MUCH TOO. I just…wow. The author has the imagination of genius. And I knoooow. I have a Splintered hole in my life. Honestly, I own mostly the seconds and onwards of series. >.> It's on my to-buy list, hehe. Ugh, I can understand. Matching books is a MUST. I've put Morpheus and Jeb on my self together and they look sooo wonderful. xD AWK. You shouldn't have read spoilers, you cheater!! 😉 hehe. I'm glad you're continuing, though, it's just the best series of eeeeever. Cait, stop posting about things I want to read but haven’t yet! But it hurts to not be able to join in on the fangirling! I can’t tell what I’m missing! Ahhh! Since I can’t think of literary love triangles right now to be able to answer your question, I shall as you a question of my own. How are you *everywhere* on GoodReads??? I swear, it’s like there’s not a single book on there that you haven’t either read and reviewed, or put on your TBR list! Not that that’s a bad thing, just wow. I am very impressed. Aw, really?! I think the romance made it, half the time. haha. It's like one of the only series I read 98% for the romance. OKAY FINE. I loved the world so so much too. I want to go to Wonderland. I'd die, but…I still want to go there. I haven’t read this trilogy (one Aussie writer, not read this trilogy – what must you think of me?) but I might eventually. I’m getting into my YA this year and ditching the MG (not completely, but I might as well be when compared to previous years), so I might. Best love triangle? Hmmm…lack of YA = lack of love triangles in general. I could kind of see one shaping up in All Fall Down what with Noah’s reaction to Grace looking for Alexei, but I might be wrong there because Noah is definitely the best friend and Alexei is definitely the love interest. Starters had a nice one, I suppose, or it seemed to anyway. I haven’t read Enders, so I couldn’t say for certain yet as Callie’s love interests haven’t actually met/I don’t know if it gets resolved. I will cry a little, but I will not come and thump you because I UNDERSTAND. Oh, don\’t ditch MG! MG is fun. *nods* I\’m actually trying to read more MG than normal, hehe. I want to try and write it. Also, I have grand plans to someday write a love triangle where the girl dithers about which guy she wants for so long that the two guys get sick of waiting and realise that they actually get on really well, and they choose each other (whether friendship or romantic relationship remains to be seen) over her. IT WILL BE MAGICAL. OOPS INDEED. GO FIX THIS. But omg, yes, yes I need that. I feel like that almost happens in Ensnared. They don\’t choose each other, but Jeb and Morpheus do gang up on Alyssa a little because she keeps leaving them in the lurch. hehe. Yes, you have just sufficiently convinced me that I REALLY need to read this trilogy right now. Beautiful writing is the one way that a book can make me treasure it right away. I seriously need more gorgeous writing in my life, and this trilogy seems like it would do the job. Also, my mind loves plot twists in all their trickery. Hmm…best love triangle I’ve read? Probably the one in Snow Like Ashes. It had the perfect balance of adding conflict and being not too overbearing. Ohhh goodie. DELICIOUSNESS. I need like the entire world to read this. That\’s not too much to ask, right?? The best love triangle I’ve read so far…well, probably the one in Snow Like Ashes. Cause even I’m having a hard time picking…also, the love…square? in Keeper of the Lost Cities is fun to read, because it’s all just cutesy crushing and no angst. At least thus far. I’m not sure if I’m going to read the Splintered trilogy…creepy and dark aren’t really my thing. But the way the love triangle resolved is genius! Yaaaaaaaaaaaaaaaaaaaaaay Cait for A.G. Howard pinning your art! THAT’S SO COOL! I haven’t even started this series yet, unfortunately, but I do plan to! Maybe sometime this spring? I love retellings, especially ones that aren’t Greek/Roman because those are sooooo overdone. Almost everything is Roman inspired these days, right?! Ahhhh. I\’m a little tired of that too. I’m going to confess that I had no idea these books existed aside from seeing the covers in passing. I know. That has been remedied and my goodreads tbr now has more precious book children on it. If I ever get crushd under the weight of my tbr (physical or goodreads) then you will know you are to blame. As for a love triangle, I can not for the life of me think of the best love triangle, even though I know I’ve read some. So, I will settle for the the worst, which is obviously Maxon/America/Aspen from The Selection. I don’t know why these [terrible] books were so hard to put down, but I wanted to punch Aspen in the face at all times. I will take the blame *hangs head in shame* If you ever can\’t find me, I\’m probably crushed under my tbr too. WELL STAAHHHP OBVIOUSLY AND JUST READ IT NOW AND THROW YOUR READING SCHEDULE. SCHEDULES AND ORGANISATION ARE FOR THE WEEK. Yes, yes, yes! 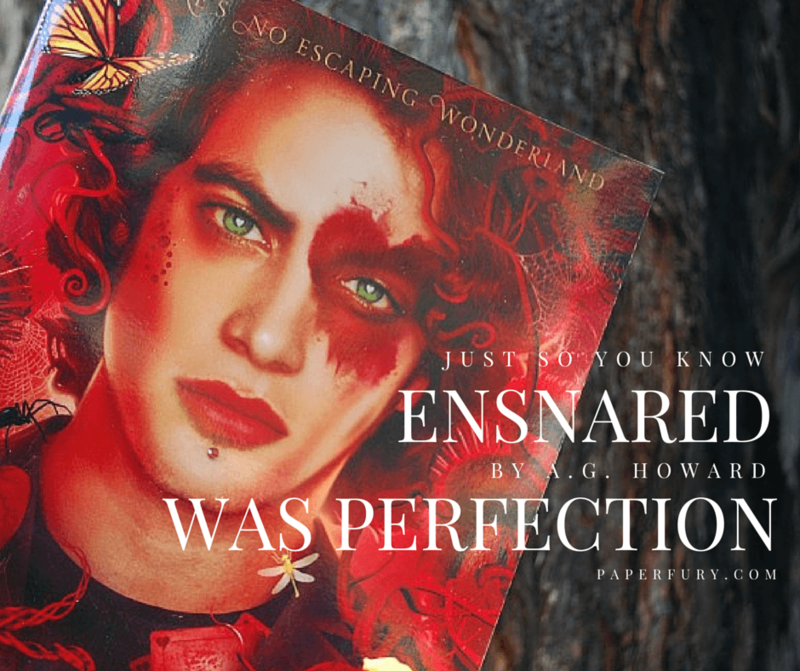 I LOVED Ensnared and your review is perfection. I didn’t like Jeb for the longest time merely because I didn’t like him as a character (not because he wasn’t written well), but I too found him more enjoyable this time around. As for Morpheus. Love him and Alyssa together. Jeb’s supposed death was shocking, I couldn’t believe it, but at the same time, I did. I could. Because Wonderland IS THAT TWISTED. Loved this book and I will miss this series as well. ME TOO!! Jeb just rubbed me the wrong way the whole time, buuuut, I have a small soft spot for him now. x) MORPHEUS AND ALYSSA THOUGH. They have so much chemistry. One of the better love triangles I’ve read was the one in the book I just finished: All Our Yesterdays. I WON\’T HATE. x) Not every book is for everyone, right?! I really really want to read All Our Yesterdays! I\’ve heard it\’s incredible! THOSE COVERS ARE SO INTRIGUING I JUST WANT TO EAT THEM… That sounded weirder than it did in my head. This post was super interesting and informing, I totally agree with every single one of your points! And although it does make me feel a bit bad when sending a review off to someone when it’s negative, I know that I can’t lie and pretend that it’s the best thing I’ve ever been sent ever. OHh, I AM SORRY FOR NOT REPLYING!! Usually I see and reply to all my comments, but I\’ve had some slack days lately. *hangs head in shame* So, if you want to email me, though, TOTALLY DO! I\’ll tell you everything I know, although my brother-in-law did a lot of it and I did…um…not much. But I can ask him questions. 😉 Are you swapping to wordpress? OMG, YOU NEED TO GET ONTO THIS ZOE. GO GO GO. I actually have a small issue with the ending, but since I haven’t read the book, I won’t judge too hard. It just seems… wrong to me. I don’t know. Maybe when I read it, I’ll be able to overlook it. I haven’t read this but I do have a signed and personalized Unhinged which I hug endlessly. See I love a good love-triangle, but there are rules that must be obeyed: 1) I must temporarily fall in love with one of the characters; 2) There must be a satisfying ending where ONLY ONE CHARACTER IS PICKED BECAUSE THE WHOLE POINT OF TRUE LOVE / SOULMATES (as love triangles are often likened to) IS THAT ONE PERSON FALLS IN LOVE WITH ANOTHER (SINGULAR) PERSON. Apologies for the shouting. I have strong feelings about love triangles. And my favourite love triangle is in Jane Eyre. Or Les Mis. Because I am classy and read classics as well as YA. And those miserable Victorians knew an awful lot about tragedy and heartbreak! Ohhh, heh. Yes. Maybe Ensnared isn\’t for you. I mean, I think it worked out and I think the author made the right decision, but again…it\’s each to their own, right?! Wonderland is a messed up world, so it makes sense (to me) that the romance would be messed up too. NO NEED FOR APOLOGISE. WE ARE ALLOWED TO SHOUT OUR FEELINGS HERE! HUZZAH! Oh god! I’m so gonna start this series! I’ve been hearing mostly good thing so far. SO I’m definitely trying it out. And if it’s good from start to finish, what else could I ask for? I couldn’t help looking at the spoiler though. I really can’t resist spoiler no matter how much I try, lol. I haven’t read the trilogy yet, because I have a thing about starting series that aren’t fully released… But now that they’re all out, I can officially start reading them and I hope I love this series as much as you did!!! Oh oh you are wise. I\’m always starting series and then wising I\’d waited. I\’ve been reading this one for 2+ years and it\’s been tooorture. And I have heard so much about the “complex” ending. I’m really curious now because on one side, there are very aggressive team JEB, on the other side are equally aggressive team MORPHEUS, and I just want to know WHAT HAPPENS IN THE END THAT EVERYBODY IS FLAILING ABOUT?!?! That’s pretty much my number one reason why I want to read this book now. Omg, everyone and everything is aggressive in this series, right? Readers and books alike. XD YOU HAVE TO READ IT AND FIND OUT. DON\’T CLICK ON ANY SPOILERS. JUST REEEEAD IT. So… I didn’t really read this review, because I own Splintered and Unhinged, and I do plan on reading them someday, hopefully soon. BUT. I skimmed. And I am so very happy that you loved it! Also, I enjoyed your pictures. But my goodness, that poor guy on the cover looks as though he needs medical attention. Has he been in a barroom brawl of some kind? Also, I should NOT have looked at the cover of Sweetly while heading to bed. That thing is going to give me nightmares, Cait. That face is CREEPY. You neeeed to read them. HEAR ME SQEAK ABOUT THEM, SHANNON. PLEASE. THEY ARE SO BEAUTIFUL. Oh, Jeb? Jeb is on the cover of Ensnared. He\’s been tortured probably at that point, just normal Wonderland stuff. fajdslkfad, thanks, Kara. XD I love quotes. I LOVE QUOTES A LOT. *calms self* Do nooooot read the spoilers. You will ruin it all. I am dramatic, but but but IT IS TRUE DON\’T READ SPOILERS. I’ve read a lot of angry reviews about the way this wrapped up (and okay, I peeked so I sort of get it) and am glad to hear another opinion. The triangle in this wasn’t for me, and I stopped after book one, but I also look forward to reading future A. G. Howard books! I always avoid reviews for highly highly anticipated books I haven\’t read yet. I AM A WEAKLING. xD So I only know what a handful of people thought and it was mostly around 3-stars. *sighs* BUT AT LEAST I\’M HAPPY. This review made hardly any sense to me since I haven’t read any of these books, OR Alice’s Adventures in Wonderland (oops), but nevertheless I GOT SO EXCITED. Now I want to read the series! I still haven’t read the other books you made me want to read, though (Throne of Glass and Cinder), so perhaps I should get on that first… Still, EXCITEMENT ALL ROUND. OKAY WELL THIS MAKES ME HAPPY ANYWAY. I really really hope you check it out, but then, eeeeep, Throne of Glass is MY LIFE. *flails forever* And I\’m about to review Fairest which is in the Cinder series and so, um, I\’m all ecstatic over that series again. XD I JUST HAVE A LOT OF BOOKLY PASSION. I refuse to answer that love triangle question! 😛 You know how I feel about them (well if you don’t you do now) but I do believe there is a way they can be well written so that I am not tearing my hair out as I read the book. Off the top of my head, Exquisite Captive was one where it worked! I didn’t love it but I think the author wrote it in a very interesting way. Anyway, I am really glad you enjoyed the finale to one of your favorite series, Cait! I know you’ve been looking forward to it but I am glad you were happy with the way it ended! OMG I need this right now! I’m so jealous you got a review copy. I’m in love with both Morpheus and Jeb I can’t pick between them because I love them for different reasons. Is it a little sad to admit the only reason I have brought this book yet is because I don’t want it to end and I’m obsessed? Thanks for the amazing and still spoiler free review! I am a very lucky duckling, that is for sure. XD AND NO! It\’s not bad to admit that! I actually put off reading my favourite of favouritest books a LOT because I get so darn nervous. Great to know that the trilogy is going to end on a high, I was terribly worried it would disappoint so phew….. thank god it didn’t! I haven’t got my copy of Ensnared yet but it will be mine……. and soon! YAAAAY! I\’m literally the only person I know who\’s given it 5-stars, but I don\’t care. x) I shall flail in my fandom alone if need be. I NEED TO READ THIS TRILOGY! OH, GOSH, WHY IS IT NOT IN ENGLISH BOOKSHOPS AND WHY DO I HAVE NO MONEY?? Also, you are totally a genius at bookquote graphics. I have no graphics/arty skills at all. I mean, have you SEEN my banner?? That is all I shall say. Yet. *close her eyes* I’m still on the first book only because apparently the world is such a sad place and I can’t say to my professor “I’m sorry, but the book you gave me is boring, can I choose one myself?” because they won’t let me. I don’t understand why. I loved Splintered so much that I HAD to buy it after reading the ebook because I wanted to have it. And I bought Unhinged directly as a book because I just know that I want it too. But I still have to read it. I am very happy that you liked the third because I hope it means I won’t be left crying for disappointment at the end. I’ll cry because it ended, probably. WHAT IS WRONG WITH THE WORLD??? That\’s what I want to know. And I often buy books I really really want and then don\’t read them straight away…for no logical reason. -_- I bought The Scorpio Races in december for a reread and now it\’s feb and I haven\’t even TOUCHED it. WAH. But I digress! x) I really hope you do finish this trilogy. And that your professor sees the light one day and lets you pick the books. hehe. Oh man I was not a HUGE fan of book 1 but I’ve been seeing so many awesome reviews of the rest of the series that it’s making me want to keep reading it. It sounds like she really made a great thrill ride and the character building/growth sounds epic!! Great review, Cait! Aw! Now I must read Unhinged. Perhaps the library has it. Eh, probably not. But maybe I’ll reserve some birthday money for it. The covers are so amazing too! UNHINGED IS INCREDIBLE. Maybe it\’s my favourite?! I don\’t even know. I can\’t pick. xD they are all so beautiful right?! FOR SOME REASON WORDPRESS HATES MY COMMENTS. Anyway, I am RIGHT NOW listening to Splintered on my phone. Because of you. So. It’s going slowly, because school is kind of sapping all my free time (I haven’t blogged in WEEKS GAH), but I am enjoying it quite. I’m also not supposed to know Morpheus’ name yet. Oh well. Currently, I am a Jeb shipper, but all I’ve seen of Morpheus is ethereal CREEP and so I don’t think I should be allowed to judge just yet. We shall see. YAY! I am so pleased that you 1. Loved the book and 2. Put spoiler tags in so I could find how it ended. Hmmmmmmmmm I don’t know about the love triangle conclusion, it seems too easy and a bit too weird haha. But I didn’t read the last two books, so I might have felt differently if I continued the story. I am so pleased you loved it though, I know how much you love this series so I am pleased the conclusion was so good. I will admit that I was Team Jeb for the first book. We knew him a lot better in Splintered than we knew Morpheus (at that point he was basically the creepy, if attractive, moth guy). Then, we got into Unhinged and I really got to know Morpheus and I will admit that I fell in love. He is like the embodiment of Wonderland. And in his own twisted, unique way, he really loves Alyssa. I fully support your fangirling over him. From then on, I was rooting for the Morpheus side of the triangle, but I really could not forget Jeb. I just wanted everyone to have a happy ending, and guess what, THAT ACTUALLY HAPPENED FOR ONCE! I was so happy with the ending and I really did not think that it was cheating at all. I mean, having the guts to wrap everything up like that and stay true to your characters is truly admirable and I was always thank A. G. Howard for that. Like you said, Ensnared was perfection and I could not have asked for anything better.